** Guide price £350,000 - £375,000 ** Robert Luff & Co are pleased to present this three double bedroom detached bungalow located in Tarring in need of modernization. The property offers good room sizes and a private rear garden with potential to extend. There is no on-going chain and internal viewing is advised. Full height double glazed front door with double glazed window to side. Obscured door, storage cupboard housing gas and electric meter, loft access, radiator. Large patio door to garden, radiator, feature electric fire with marble hearth. Measurements to include built in units. Range of matching floor and wall units with inset single bowl stainless steel sink, integrated double oven, inset four point gas hob, space and plumbing for washing machine and fridge/freezer, three double glazed windows to rear and side, lino flooring, wall mounted boiler, part double glazed door to garden. Double glazed bay window to front, three radiators, built in wardrobe offering hanging and shelving. Measurements to include built in wardrobe offering hanging and shelving, double glazed window to front and side, radiator. Wet room, wall mounted power shower, radiator, obscured double glazed window to side, tiled walls, store cupboard housing water tank, lino flooring. Obscured double glazed window to side, lino flooring, low-level w.c.
Block paved drive to garage with space for multiple cars, partly laid to lawn, low level retaining wall, flower and shrub borders. Mainly laid to lawn, patio area, sheltered area, side access from front, private, garden shed, access to garage, fenced surround, flower and shrub borders. 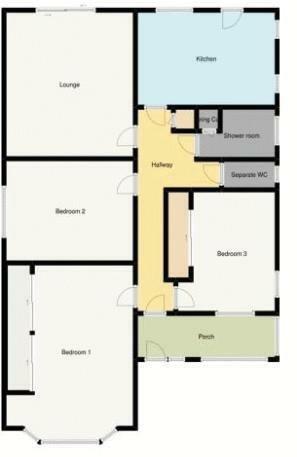 Up and over door, power and lighting, parking to front, double glazed window to rear.